Tommy McRae ­– also known as Tommy Barnes, Yackaduna and Warraeuea – was born in the 1830s near the Goulburn River in Victoria. At this time, many Indigenous people were being moved to mission reserves like Coranderrk and Cummeragunja, but McRae refused to leave his land. Despite opposition from European settlers, McRae developed a small, independent community, which prospered through the resourcefulness of its people.To support his family, McRae sold his artwork, as well as poultry, fish and possum-skin rugs. He was known as ‘a man of substance,' and ‘an astute financier', even earning enough to buy himself a horse and buggy. 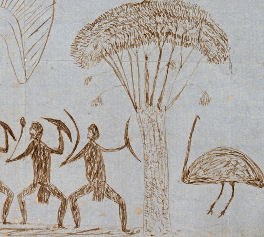 As with other Aboriginal artists of the 19th century, like William Barak, Tommy McRae drew images of Indigenous customs – such as hunting, fighting and corroborees – that were disappearing as a result of European settlement. But McRae also recorded new features of the landscape, like Chinese settlers, firearms, alcohol and squatters. He placed squatters and other European settlers on the edge of his drawings, while Indigenous people featured at the centre, full of life and action. McRae's art not only recorded the effect of European settlers on Indigenous life, it gave a new perspective to the relationship between settlers and Aborigines themselves. The Blacks are the most observant people I have ever met [...] I am amused at their remarks re the shortcomings of my art - the difference between their art and mine is that however roughly theirs is done it has the look of life mine never has. Parker compliments McRae's work but then calls it ‘rough' and says that she finds his critique of her work ‘amusing'. Positive comments about Indigenous people from this time are often qualified in this way. William Buckley was also a subject of McRae's art. But unlike most European artists and writers, McRae's work did not focus on Buckley's return to white society, but his time with the Wathaurung people. McRae's art offers a rare Indigenous perspective of life during the early years of European settlement in Victoria. When the European settlers arrived in Victoria few believed they were taking land that was not rightfully theirs.